Diabetes self-care is much more fun when I’m happy. It’s so much easier when I have a smile on my face. For a long time I thought negative emotions could be controlled or denied. I thought I could just put on a smile, and they would go away. But they didn’t. Then I ran across the work of David Reynolds Ph.D. In his book, “Pools of Lodging for the Moon,” he presents a list of seven behaviors that make us miserable. Now, whenever I am feeling down, I review this list, and sure enough, I have been doing one of these seven behaviors. Doing any one of these will cause me to be miserable. I have found that it’s possible to stop doing these and have been much happier because of it! Before we read this list, I want to present a concept that has been life-changing for me-understanding that I can’t control my feelings, but I can control my behavior. Feelings are an important part of human life. Some feelings we enjoy, like happiness, confidence, and love. Other feelings we don’t enjoy, like fear and loneliness. I used to try to change or ignore my negative feelings-but it never helped. We can’t control our feelings, we can not make them go away. Just like we don’t say, “I digest my food,” or “I circulated my blood.” They just happen. The best way to handle feelings is to acknowledge them, accept them, and learn from them. This list below is seven behaviors that we can control. With practice, we can stop them altogether and live a much happier life. Being aware of these behaviors in ourselves is the first step to creating a happier life. If I spend time thinking how things “ought” to be, I can make myself pretty miserable. “MyA1C should be as good as Johnny’s. I shouldn’t have so many lows.” It’s a strategy people use to keep themselves feeling terrible. Much misery comes from choosing to beat ourselves up for not being good enough. This is not about avoiding changes, we need to make changes, but there needs to come to a sound recognition of the way things are, and acceptance, even though we may want to change them. Reality presents itself to us the way it is. I may not like my height, but if I spend time wishing I was taller, I can keep myself pretty miserable. I may not like having diabetes, but if I spend time denying it, I will be miserable. Fighting reality also includes procrastination. Reality presents deadlines, like paying bills, that we can’t avoid. When we tell ourselves “I can do that later,” and then we miss the payment deadline, we’re miserable. I have been a procrastinator my whole life, and it has made me miserable! Since I realized that procrastination is fighting reality by lying to myself, change has taken place in me. Now that I know this behavior causes me to be miserable, I can make a choice. I can’t change my feelings, but I can change my reaction to these feelings. When we are too focused on ourselves, we miss the very varied and interesting reality we live in. Many things happen everyday that I could take personally. For example, if someone doesn’t call me back or answer my emails, I can make up all kinds of stories about why. “They don’t like me, they’re not answering me on purpose, they’re are upset with me.” I am making this all about me, and it makes me unhappy. Usually, the person calls later and the delay had nothing to do with me. I have found when I stop making up stories and taking things personally; I am much happier. Purpose gives us something to focus on, pulls our attention together, so we’re not fragmented by our fear. Following your bliss may sometimes be bliss, sometimes misery that’s normal. Are you eating right/regularly? Are you getting enough exercise? Are you sleeping well? If not, you can’t expect your mind to be focused and together. Sloppy or unhealthy lifestyles lead to sloppy thinking and an unhealthy mind. Mind and body are one. Your body I can see, but your mind only gives me indications of its existence through your behavior. That’s all we can know; I can’t see your mind. Your mind is guided through healthy physical life habits. Can’t, don’t want to, don’t like it the way it is, shouldn’t be this way, won’t work. If you sit with shoulders slumped and say over and over, “It’s hopeless, no one cares about me,” you will start to feel helpless and hopeless. This is why it can be damaging to watch the news every day. Many writers, including Deepak Chopra, Marianne Williams, and Tony Robbins, all express in their works how gratitude is essential for happiness. David Reynolds also reminds us there are many things to be thankful for that we often forget. Right now I am sitting on a chair while I type. Someone built this chair, and I am thankful I have it to support me while I sit. Someone in my childhood taught me how to read, and I am very appreciative of that! I am also really thankful my home has a vacuum cleaner someone built for me, and there is someone down at the electric company keeping to power going so I can clean when I need to. This list goes on and on. Concerning my diabetes, I am very thankful that insulin was discovered and made available for me to be alive. Also, I depend on my meter to help me decide when and how much insulin to take. I’m feeling uplifted just reminding myself of these things. 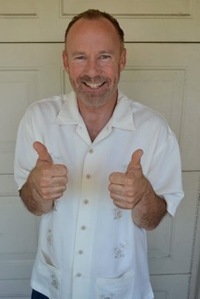 Scott King is a Certified Transformational Life Coach. King was co-founder and former editor-in-chief of Diabetes Health and has thrived on insulin injections for 38 years. You can also sign up for his free blog at www.DiabetesSuccessCoaching.com.